Members of the council will share their some of their favorite effects and then teach them. This will be followed by an Q&A and Club Night. Noel is a professional magician and magic consultant for Objective Productions advising on shows such as Help My Supply Teacher is Magic and Killer Magic. In his almost 15 years as a professional magician he's performed several stints at The Magic Castle in Hollywood, at the Harry Potter wrap party and a private show for Saudi Royal family with armed guards watching on. He was awarded the Magic Circle Originality prize for 2014, 2015 and 2016. He has released several products to the magic community including Alarmed and iDeck. In this lecture he will share his inventive close up magic which has a strong focus on quirky humour. From classic magic plots to wildly original premises there is something for all fans of close up magic. About. 50/50 card to non card material. Informal dearler dem and browse. Unfortunately Wayne has had to cancel due to a double booking. Tri-Wizard evening "Masters of Magic" with the 3 categories being Dia Vernon, Paul Daniels and Derren Brown. We need your best routines for the upcoming SMC promotional video. Bring something visual to perform for the camera. This evening will be filmed for clips to add to the SMC youtube channel. Regretably Etienne Pradier had to cancel. Unfortunatly due to unforseen circumstances the dealer dem is postponed. 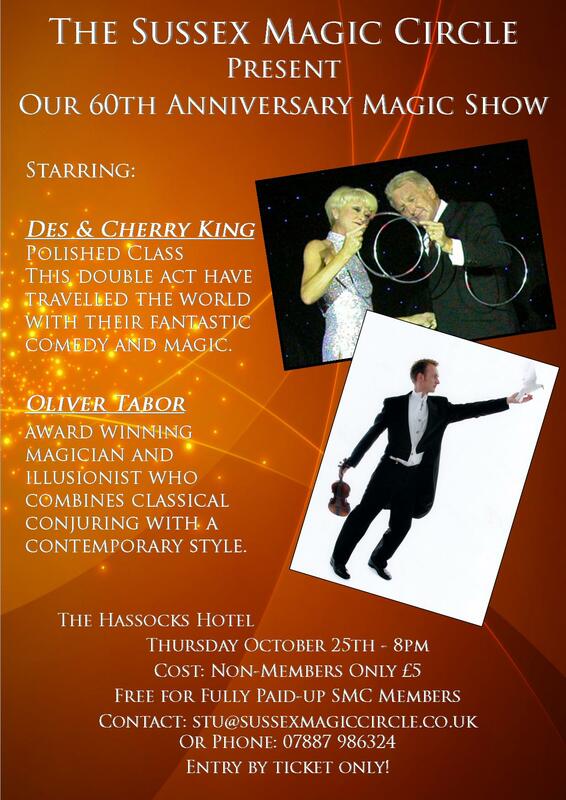 A fantastic cabaret show featuring Des King & Cherry and Oliver Tabor. Because the event is being held on the Fourth of July (American Independence Day), there is a U.S. theme. Dinner & cabaret. Only 35 per person. Social night in the main bar. Non members 5 pre-order, 10 on the night. Wednesday @ 'The Parish Hall', High Street, HANDCROSS. Alakazam are kindly sponsoring the competition this year. Comedy, magic, mentalism and more comedy. Bad news: Unfortunatly Paul Zennon had to cancel as he'll be out of the country. Great news: James has agreed to lecture for us, "fancy a pot of jam?". the 16th card principle. See Paul's site for more details. Paul has kindly offered to teach in detail all the slights and moves required for his May lecture. This will ensure we all get the absolute most out of all his hard work. Please bring a pack of cards to ensure you can join in. At the White Hart Hotel, Lewes. Enjoy good food, a super cabaret, music and dancing. The winners of this years competitions will entertain us again. Find out more at Don's Web site. Bring your Kaps, Balduchis, Assassins and O'Connells and let's find out which wallet wins. Please attend, it's your chance to speak up. Story telling magic. Warning Tarrot may be used. The music and illusions of Vizage. The comedy and juggling of Micheal Pearce. All for only 30 per person. "Thirty years a member of The Sussex Magic Circle!" informative and full of practical ideas. If you've not seen Paul lecture before, now's your chance. If you have seen Paul before, come see his new stuff! All great fun, workable & magical! Learn Sleights, Tricks, Presentation Tips, Tips on The Business & more! lecture, Paul will reminisce about his 30 years at The Sussex Magic Circle. The confusing rules ADDS to the enjoyment of this evening. Again we have no HQ, so as last year we will have a pub night, bring your partner. Please meet in the Five Bells in Chailey at around 8pm. Close-up magic convention organised by members Mark Worgan and Paul Gordon, see www.cumcis.co.uk for details. Several members will be performing magic at a local care home. If members would like to help, please contact John Southgate. Competitors performing at different tables just like the real thing. Mat Cammiss will be organising an entertainment extravaganza. Alan, Gordon, Stuart, Bertie,Christian, Des and more, including live music. A popular night run by you. Bring magic and talk about anything at a table with your tea and coffee. A social gathering at a local Chinese Restaurant. Have a meal, chat and relax with your magic. Bring your partner. Once again we visit the mentally handicapped at Burnside for a great afternoon of tea and magic. New format as discussed at the AGM. Members only, come along and share you views to shape your club, your votes count.